The song continues in the story of the Von Trapp family. The next generation is continuing in their family tradition of sharing their hearts and songs through music. Sofia, Melanie, Amanda, Justin and August are all grandchildren of Werner von Trapp. Werner was a member of the Trapp Family Singers and is Kurt in The Sound of Music. These young people and their singing cousin, Elisabeth von Trapp, are continuing the family legacy. The children, based in Montana, began their singing career performing in an adaptation of The Sound of Music in 1997. How apropos is that? Their grandfather, Werner, taught them many of the folk songs he sang over the years. In 2001, when he became too ill to visit the family, the children recorded the songs to cheer him up. Their career soon took off and they began performing for others. 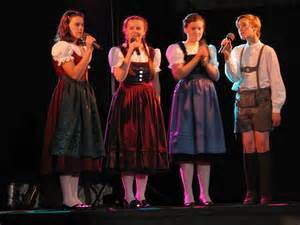 The group of children released their first album in 2003 as The von Trapp children. As the children have grown into young adulthood, they’ve changed their group to The von Trapps. Justin left the group and was replaced by August. The children have traveled throughout the United States and world and performed with some major symphonies, including the Boston Pops, Atlanta, Philadelphia and Baltimore. They have also performed on a number of talk shows including The Oprah Winfrey Show, The View and The Today Show. In 2006, they were awarded the Special Award for Outstanding Young Family Singing Group at the Young Artists Awards. The children have embraced their Sound of Music origins, performing songs from the musical, along with other folk songs, pop music and classical pieces. As young adults the group are embracing their roots, while moving into the modern age with original works and more eclectic style.